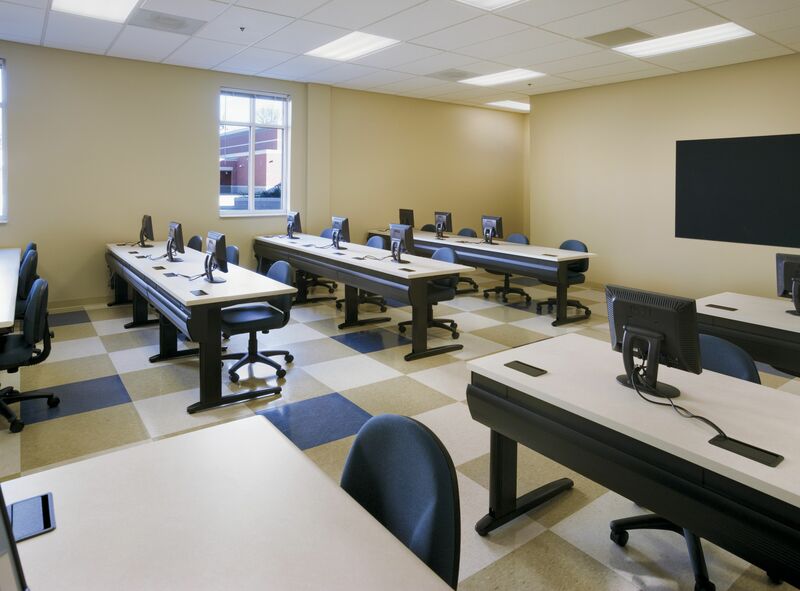 My school director has given me the opportunity to redesign the layout of our school's IT lab to better suit my classes. Currently the computers are in the "inverted U" layout listed here so that I can monitor students' monitors but not their faces. I find that this makes classroom management difficult (I teach grades 6-9). Students frequently get distracted by what is on their neighbors' computers, and every student can see every other student's monitor without much effort. It also makes individual work like quizzes/exams basically impossible. If I have to make an announcement I am making it to the backs of students' heads. Students have to turn their whole chairs around (we don't have office chairs) to pay attention to a lesson, which means they can't comfortably take notes on what I am saying or what I write on the board. 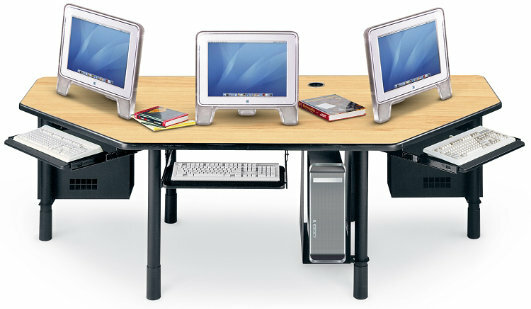 computers in four rows: one row against each side wall (students facing the walls), two rows together in a center island (students facing each other), such that I would have an oblique view of the monitors from the front of the room and students would have to rotate about 90 degrees to face forward. The features that should guide your classroom layout are visibility, accessibility, and distractibility — maximizing the first two, and minimizing the third. Visibility is simple: every student should be able to face forward easily with unobstructed view, and I should be able to see every student's face. Accessibility, here, means that I should be able to get to every student quickly, and that students should be able to work with each other when I assign pair-programming tasks or ask them to discuss a question with neighbors. 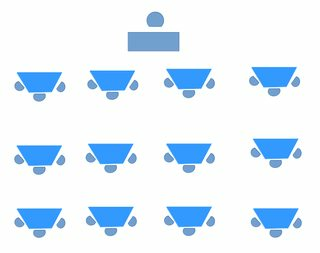 Those first two considerations already rule out front- or rear-facing rows, and some cluster arrangements as well. Screens should be less than about 120° from facing the front of the room — ruling out rear-facing screens. Lectures should be short and focused. I ask students to bring a notepad and writing tools, for drawing or taking notes while their monitor is off. I aim to limit lecture time to ten-minute chunks at most, punctuated with pair discussions. Because I have the students turn off their monitors, my lectures must require either no handwritten note-taking, or minimal note-taking (which then requires me to give some explicit instruction on how to take notes). Now, I have taught in labs with traditional rows (students facing forward, monitors back), clusters, and variations on the "inverted U" design you're talking about. Currently my lab is set up with student workstations all along the left and right walls, so that students are all facing the wall while working, and the computers are all facing inwards — very much like the last option you described, only without a central island (because the room is too small for one). This is my preferred layout. So, I would endorse the last option you suggested, of computers along the side walls, with an optional cluster of side-facing machines in the center of the room. A modification to the traditional classroom arrangement that is relatively simple is to replace the straight tables with half hexagon tables. Place them so that the center seat is facing the front of the room and the other two seats will only need to pivot 60 degrees from their screens to see the front. The students will still be able to look at other screens, but not without being obvious about it. It naturally groups the students into teams of three for when you have team-based assignments. You can have a pair of mirrors installed in the two rear cournes near the ceiling. In the mirrors you will be able to see basically what they have on their screens. Reading it, or even knowing for sure what it is won't be possible, however, you will be able to tell if it's what should be there. Games and videos will have a totally different look from an IDE, for example. Set the tables into a normal rank and file arrangement with a gap between each column that allows you to walk between the students when seated. 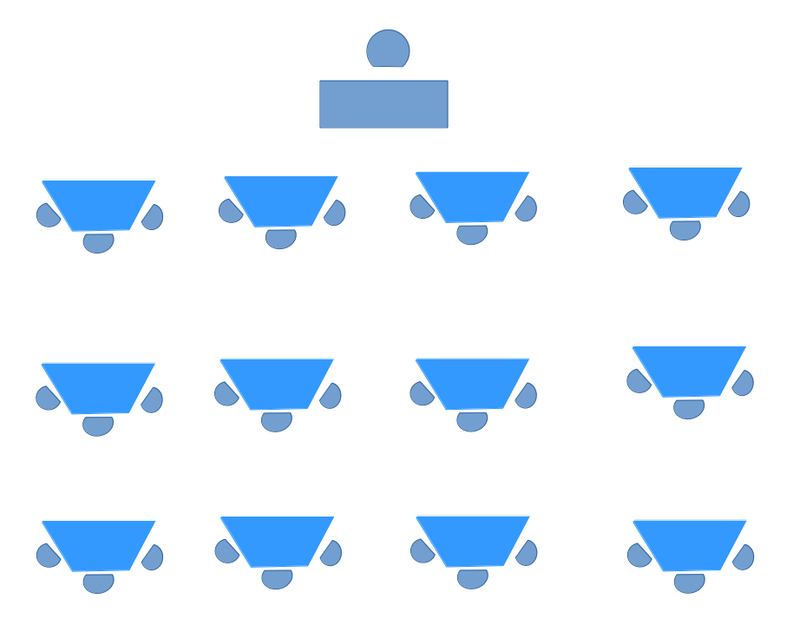 (The gap with students in their chairs will be less than it looks like with empty seats.) In this arrangement you can get to any student's station to assist them when needed. 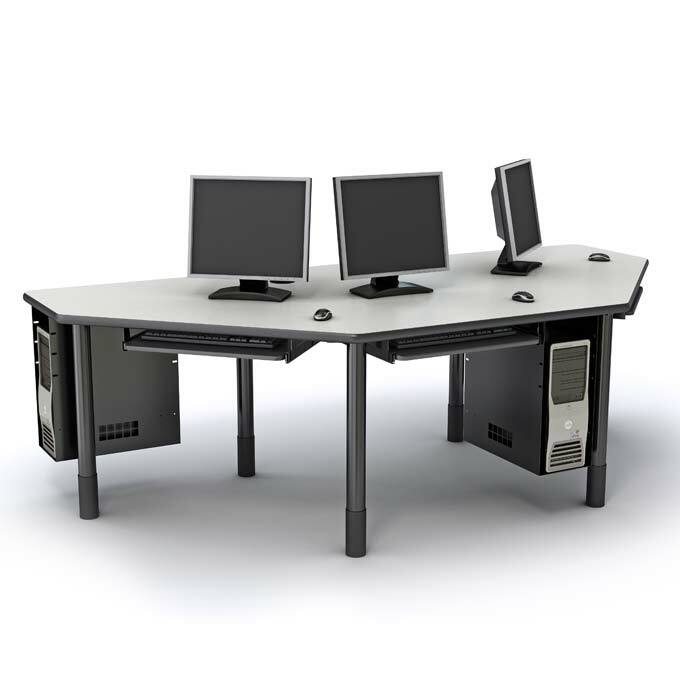 In addition, because of the geometry of the half hex layout, the gap between neighboring students is increased, allowing more room for you to reach the table top without disturbing either student. 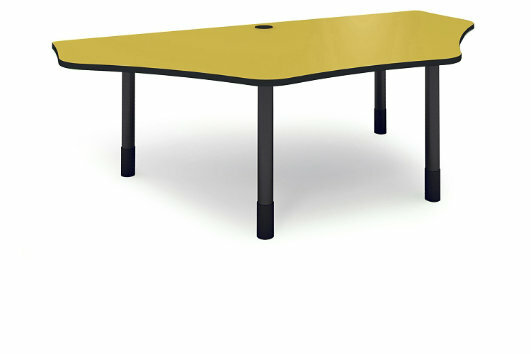 Half hexagon tables are available in some different set ups. You can use the standard, non-computer style that may even be in storage already. 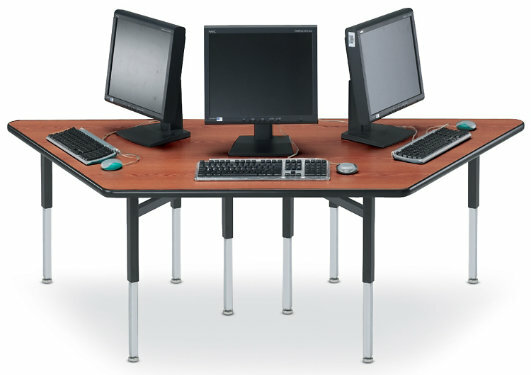 I've found some online that are designed, nominally, for computer use, and a bit larger to accomodate the keyboard and monitor space requirements better. I've also found one that's designed completly for computer workstations, including a keyboard tray and a cage for the tower. (Links at the end.). Not knowing the constraints of the classroom itself, I can only give a sample layout. Allowing for 36 students, you could arrange the room similar to this. A few desks I've found online. You may address your primary concern with the privacy filters (as low as $7.99 apiece) without changing the layout at all. If the school director gave you not only an opportunity, but a budget as well, I'd recommend to invest it in good chairs. An ability to adjust height is immensely important. Not the answer you're looking for? Browse other questions tagged classroom-management or ask your own question.